Snowshoe hare have managed to adapt to all the changes over the years and continue to thrive in great numbers. Is an action packed adventure in the woods what you're looking for? A rabbit hunt at Bulldog Camps is for you. Season runs from October 1st - March 31. The snowshoe hare is a medium-sized rabbit. Its name comes from the fact that the animal's hind feet are very long and the toes can be spread out to act like snowshoes. These large feet also have fur on the soles which protects them from the cold and increases traction. Over most of this rabbit's range, the color of its coat varies seasonally. Its summer pelage is rusty, grayish brown. During the winter its coat is white, except for the eyelids and tips of the ears. Snowshoe hare can reach a length of two feet including their two inch tail, and they can weight 3 to 5 lbs. The snowshoe hare is completely vegetarian, feeding on many plant species in summer, and bark and shoots in winter. The main difference between hares and rabbits is that rabbits burrow and hares do not. The snowshoe hare breeds between March and August, with gestation lasting a month to five weeks. 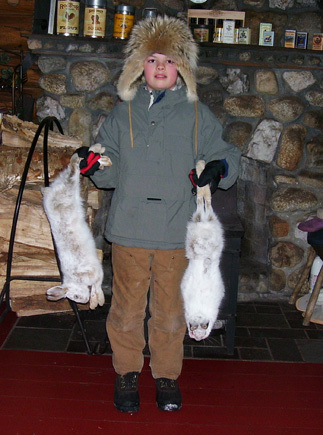 Hunting Snowshoe rabbits is an action packed adventure for young and old hunters alike!